Connecting Mariner’s Ridge to Kuliouou. I’ve been hiking in Hawaii since early 2009. In the winter months when surf in the South Shore is flat and surf in the North Shore is monsterous, I needed something to do to stay active. 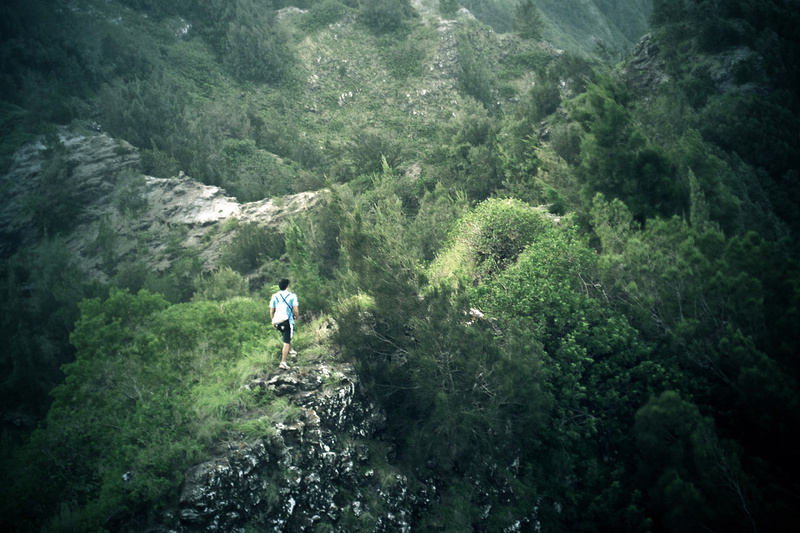 Hiking fit the bill and once I got into it, I found out there are more hikes on Oahu than I could have ever imagined. When you’re a transplant to Hawaii like me, there are a few bits of info that’ll help you figure out how the hiking trails work. When you read about hiking on Oahu you’ll hear these names a lot. Most of the hikes are on one of the two mountain ranges. 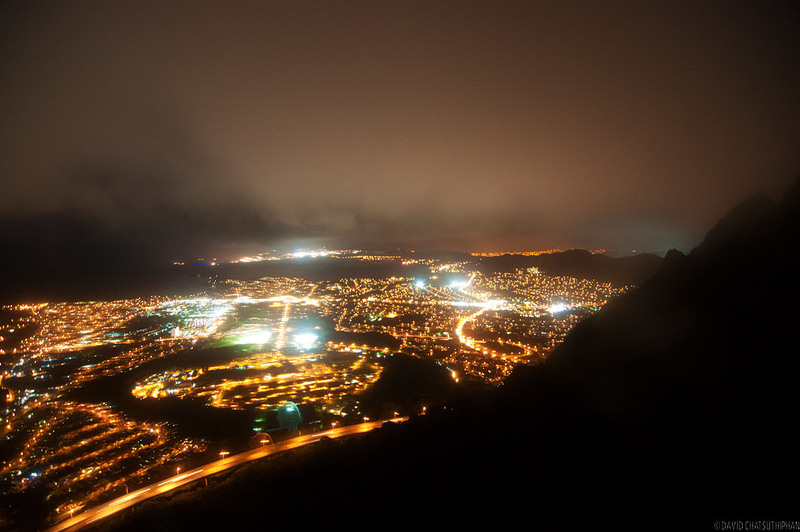 See, the island of Oahu was formed by two volcanos, the Koolau Volcano in the east and the Waianae Volcano in the west. As they erupted over time, they rose out of the ocean creating two mountain ranges. The volcanoes eventually filled in the space between them to form the island of Oahu. A note on trail ribbons: I’ve seen two colors of ribbons on trails. I believe pink ribbons are used to mark the main trail and the blue ribbon are used on more overgrown trails. Someone please correct me if I’m wrong. 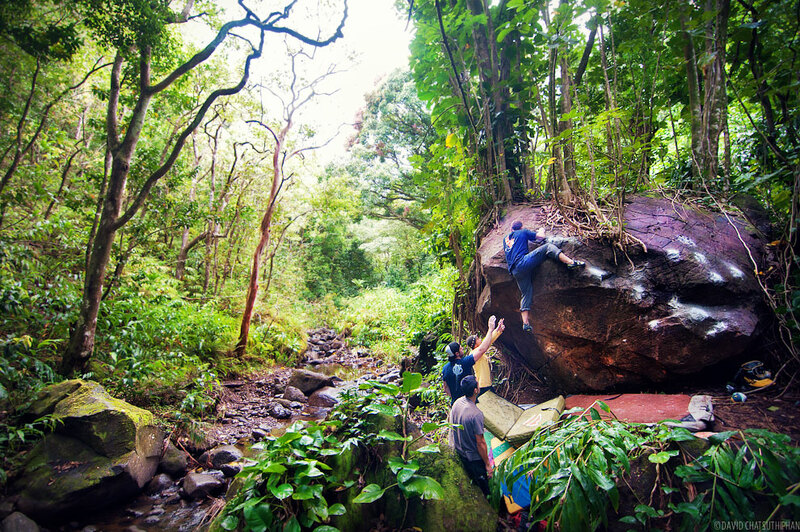 If you’re new to hiking, the best place to start exploring is the area between Aina Hina and Hawaii Kai. So, between the Kahala Mall and Hanauma Bay. Each of those ridges have novice friendly hikes with amazing views at the end. It will get you hooked. Once you’ve done those, you can use this of the Best Hikes in Hawaii to pick out a hike in an area that interests you. The hiking posts should help you figure out if the hike suits your mood. When I first started hiking I took along with me one of those ultra-compact digital cameras. Problem was, every time I came home and checked the pics I was frustrated with how they failed to capture the amazing views I had just seen. What I realized was that my lens was not “wide” enough. So, while I could see this expansive view with my eyes, my camera seemed to have blinders on. And to make it worse, the image quality wasn’t good enough to capture all the detail of the landscape. Nowdays (in 2010), there’s a growing list of high-quality point and shoot cameras to choose from. They are labeled as “prosumer” class cameras and have better image quality than the smaller point and shoots and much wider lenses. I use a Panasonic LX3. There’s also a great (but slightly larger) model made by Canon — the G11. Why not a dSLR? The answer is simple. It’s heavy. On a short hike I’ll take a dSLR, but on a longer hike when I’m already packing 2 liters of water or more, I leave it at home. But, if I had money to burn, I’d definitely pick up a Micro Four Thirds camera like the Panasonic GF1. UPDATE: I’ve begun taking my dSLR on hikes. I purchase an R-Strap which allows me to sling the camera around me like a messenger bag. When the hiking gets tough, I clip the camera to my Camelbak strap using a keychain carabiner. When I do this, it sits up on my chest. It’s heavy and it throws off my center of gravity sometimes but the picture quality makes it worth the trouble. It’s amazing how many people I see on hikes in running shoes. I’m not amazed however when I see them slip and fall. When you’re hiking in Hawaii your often going through the rain forest or end up high up on a mountain. Both environments get frequent rain. Hence, mud. Hence, the need for grip on your shoes. Also, we have young rock here that breaks up into gravel. This loose gravel can be more slippery than mud and when you’re a thousand feet up on a narrow ridge, you’re going to want some traction on your shoes. But, I’d advise against hiking boots. They are too heavy and totally unnecessary. I recommend trail running shoes or light hiking shoes. The trail running shoes are great because they are feather light with tons of traction. But, the soles aren’t as sturdy and you can feel rocks through them. This can make your feet sore on a long hike. I’m using some low top hiking shoes from Merrel right now. They’re fairly light weight and water resistant. I ran out of water once on Olomana. So did the two friends I was hiking with. We did the 2/3 of the return trail without a drop to drink. And it was hot. That wasn’t life threatening but I learned my lesson. I use a Camelbak now. If you do a lot of hiking you’ll want to invest in one. Since I only do day hikes and like to keep my load light, I chose a model made for mountain bikers. These are more narrow and compact than their hiking packs. When it’s hot and you need energy, you need sugar. I find that dried mangos are the best energy boost. You can get ’em on your pre-hike 7-11 run. If it’s a longer hike, I’ll also bring some beef jerky and a cereal bar. Hiking in Hawaii is super safe. We don’t have snakes, mountain lions, or poisonous bugs. There are wild boars roaming around but I’ve never seen one. Just don’t fall off the mountain. Of course you want to hike with a partner, watch your daylight, blah blah blah. But, overall, there’s not much to fear. One thing I’ll mention though is Letopspirosis or “lepto.” Lepto is a bacteria that could possibly be found in all fresh water on the island. Especially standing water. You know, like in those pools people like to cliff jump into. It can make you sick and cause organ failure. But, if you swim in one of these pools and feel sick after, just go get some anti-biotics and you’ll be fine. Na Ala Hele – Trail & Access System – The State of Hawaii Trail and Access Program. The Hawaiian Trail and Mountain Club – A Oahu based hiking club that’s been around for a hundred years. If you’re looking for a group to hike with, join ’em. They hike every week. Happy trails and be safe.